The Academy Award Nominee for Best Animated Feature Film, Spider-Man: Into the Spider-Verse, swings onto Digital February 26 and on 4K Ultra HD Combo Pack, Blu-ray Combo Pack, and DVD on March 19 from Sony Pictures HomeEntertainment and Sony Pictures Animation. From Phil Lord and Christopher Miller, the uniquely creative minds behind The Lego Movie and 21 Jump Street, the film offers a fresh vision of the Spider-Man universe with a groundbreaking visual style that’s the first of its kind. Sony has enjoyed a great deal of success with their animated Marvel Comics adaptation, both critically and commercially. For many fans out there, it’s proved to be one of the best representations of Spider-Man on the big screen, live-action or otherwise, to date. Now, those fans will have the chance to bring the action home just in time for spring break. Spider-Man: Into the Spider-Verse, a film that has grossed over $350 million in theaters worldwide to date, introduces Brooklyn teen Miles Morales, and the limitless possibilities of the Spider-Verse, where more than one can wear the iconic mask. Say Directors Bob Persichetti, Peter Ramsey, and Rodney Rothman. 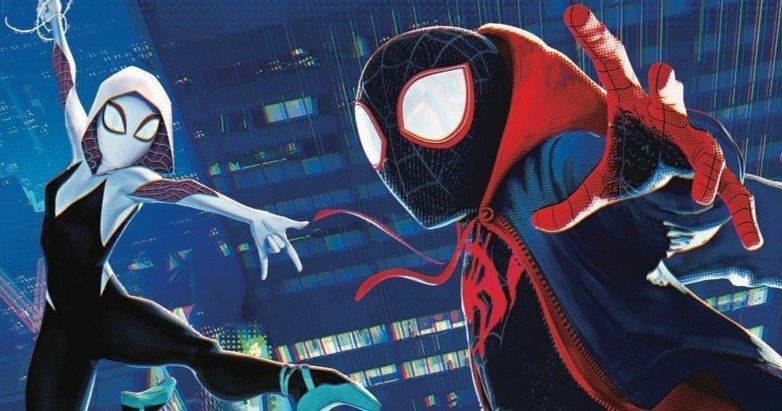 The out-of-this-world voice cast includes Shameik Moore as Miles Morales alongside Jake Johnson (New Girl) as Peter B. Parker, Hailee Steinfeld (Bumblebee) as Gwen Stacy/Spider-Gwen, Mahershala Ali (Green Book) as Miles’ Uncle Aaron, Brian Tyree Henry (Atlanta) as Jefferson Davis, Lily Tomlin (Grace and Frankie) as Aunt May, Luna Lauren Velez (How To Get Away with Murder) as Rio Morales, Zoë Kravitz (Big Little Lies) as Mary Jane, John Mulaney (Big Mouth) as Spider-Ham, with Nicholas Cage (The Croods) as Spider-Man Noir, Kathryn Hahn (Hotel Transylvania 3: Summer Vacation) as Doc Ock and Liev Schreiber (Ray Donovan) as the villain Kingpin. To go along with the announcement, the studio has also revealed that Spider-Ham will be getting a new animated short on the home video release. A brief preview of this animated Spider-Ham short sees the character, as voiced by John Mullany, swinging along wanting to eat a hot dog, in sick and twisted fashion. He’s then captured by an evil villain and put into, for lack of a better word, a hammy scenario that nods to the James Bond classic Goldfinger, while carrying the vibe of a classic Looney Tunes short. With Tom Holland’s version of Spidey hanging out with his fellow Avengers over in the Marvel Cinematic Universe, Sony decided to make use of their Spider-Man rights by making a theatrically released, big-budget animated feature, centered on the Miles Morales version of the character. That proved to be a brilliant move. The Bob Persichetti, Peter Ramsey and Rodney Rothman-directed movie, which is produced by The LEGO Movie directors Phil Lord and Chris Miller, currently sits a 97 percent approval rating on Rotten Tomatoes, to go along with its impressive $356 million haul at the box office. It also won a Golden Globe for Best Animated Feature and is up for the same award at the Oscars. Spider-Man: Into the Spider-Verse arrives filled with engaging bonus materials that are fun for the whole family and give fans even more of the unique comic book style action that they loved in theaters with over 90 minutes of bonus content. In his very own original short, Spider-Ham: Caught In a Ham, fan favorite Spider-Ham defeats his greatest foe, delivers sidesplitting puns, and get sucked into another dimension! It actually can get weirder! Don’t miss the thrilling Alternate Universe Mode where fans can view the film in an entirely new way to discover alternate scenes, plotlines, characters, and more with the filmmakers as their guide. Also included is The Spider-Verse Super-Fan Easter Egg Challenge, where fans are challenged to find every single Easter Egg hidden within the Spider-Verse (and there are a lot of them!). Explore the character design in the visually stunning film including specific looks at the now-iconic Spider-Ham character as well as the classic villains who inhabit the Spider-Verse. Additional special features include a celebration of the diversity in the film and the idea that anyone can wear the mask in a feature called We Are Spider-Man, a featurette called Spider-Verse: A New Dimension, where fans can hear from the artists and filmmakers who pushed the boundaries of the comic book artform to create a visual experience unlike anything done in animation before, a showcase of all the amazing fan favorite characters featured in the Spider-Verse and the actors who bring them to life, and a touching tribute to comic legends Stan Lee and Steve Ditko, who originally created the Spider-Man character. Other bonus materials include two lyric videos featuring “Sunflower” by Post Malone and Swae Lee and “Familia” by Nicki Minaj and Anuel AA (feat. Bantu). • We Are Spider-Man: Exploring and celebrating one of the key themes of the film, We Are Spider-Man takes a deep dive into the diversity of the characters and aspirational core that any person from any gender or cultural background can wear the mask. • Spider-Verse: A New Dimension: With a stunning visual style and state of the art animation designed to take the viewer into the pages of a comic, Spider-Man: Into The Spider-Verse is not only a love letter to comic books but a groundbreaking take on the super hero genre. Hear from the artists and filmmakers who pushed the boundaries of the artform as they discuss their journey. • The Ultimate Comics Cast: Enjoy this showcase of all of the fan favorite characters featured in the Spider-Verse and the spectacular cast who were chosen to bring them to life. • A Tribute to Stan Lee & Steve Ditko: Celebrate the amazing legacy and powerful spirit of the creators of Spider-Man. • The Spider-Verse Super-Fan Easter Egg Challenge: The Spider-Verse is loaded with Easter Eggs, from cameos to comics references. Fans are challenged to find them all! • Designing Cinematic Comics Characters: A breakdown of all aspects of the character design including costume, movement in animation, and distinct powers for each character. • Heroes & Hams: Meet the amazing Spider-people of the Spider-Verse. • Scorpions and Scoundrels: Explore the classic villains who wreak havoc on the Spider-Verse. • Alternate Universe Mode: In this all-new viewing experience, discover alternate scenes, plotlines, characters, and more with the filmmakers as your guide. * All-New Original Short “Spider-Ham: Caught In a Ham” It’s another normal day for Peter Porker, a.k.a. the Spectacular Spider-Ham, fighting bad guys and loving hot dogs, until a mysterious portal starts messing with the very fabric of his cartoon reality. Spider-Man: Into the Spider-Verse has a run time of approximately 117 minutes and is rated PG for frenetic sequences of animated action violence, thematic elements, and mild language. This news comes direct from Sony Pictures Entertainment.